Apollo 8 sitting on John F. Kennedy Space Center (KSC) Launch Complex 39A (LC-39A) in the time leading up to launch. 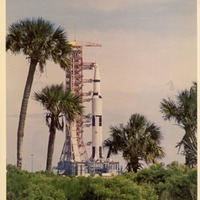 This was to be the first launch at Kennedy Space Center and at LC-39A. Apollo 8 was the first manned launch of the Saturn V rocket, which produced over 7.5 million pounds of thrust. Additionally, Apollo 8 was the first manned spacecraft to leave earth orbit and successfully complete orbiting of the Moon. Original color photographic print, December 1968: Private Collection of Dr. Calvin D. Fowler. Digital reproduction of original color photographic print, December 1968. "Apollo 8 (24)." John F. Kennedy Space Center, National Aeronautics and Space Administration. http://www-pao.ksc.nasa.gov/history/apollo/apollo-8/apollo-8.htm. 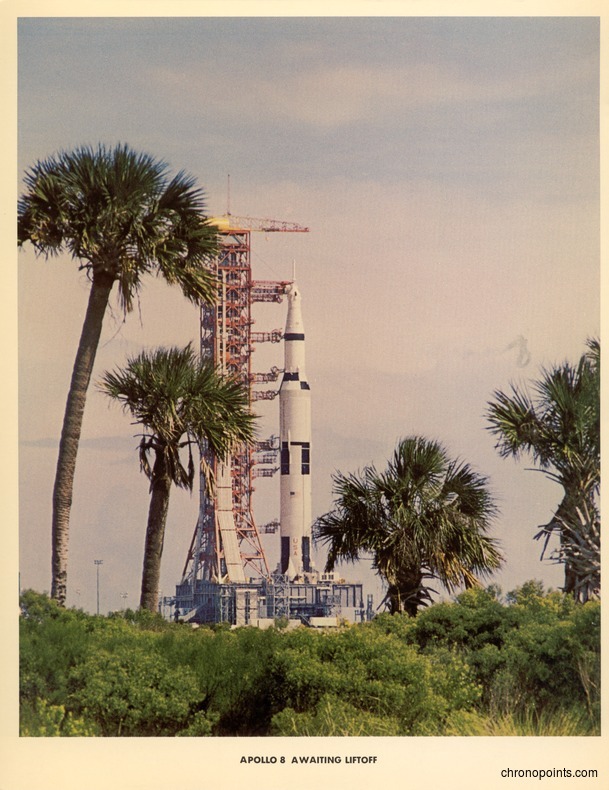 “Apollo 8 Awaiting Liftoff at John F. Kennedy Space Center Launch Complex 39A.” RICHES of Central Florida accessed April 21, 2019, https://richesmi.cah.ucf.edu/omeka/items/show/5017.